The Manhattan Curve optical wireless mouse combines modern design with advanced precision and high-stabilization performance. Its top-mount push-button instantly shifts resolution from 800, 1200 and 1600 dpi to suit a wide range of applications, including routine computing tasks or computer games and editing requiring a fine touch. Its full-sized shape and five-button configuration provide direct access to essential commands with minimal wrist movement. A non-slip texture applied to critical surfaces helps provide a secure, comfortable grip. The remarkably small yet powerful USB micro receiver with 2.4GHz technology provides an effective range of up to 10 m (33 ft.) and stores in a special on-board compartment or remains installed for true wireless convenience. Automatic power management helps maintain proper battery levels for reliable operation. Plug-and-play capability and Windows and Mac OS compatibility offer quick and easy installation. 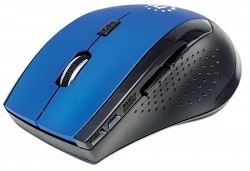 The Curve wireless optical mouse requires little maintenance for long-term, dependable service. Helps deter theft of notebook computers and other valuable equipment.